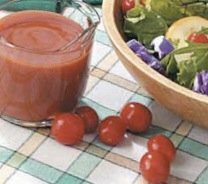 Secret Recipe homemade salad dressing was- believe it or not- the way restaurants in my hometown competed for repeat customers. Craving that you-can-only-get-it-here flavor brought us back again and again. The hands down winner was an old fashioned downtown restaurant with business-like waiters in white jackets, chic leather-like black booths, and subtle lighting. Soon after we placed our order the pice d’reisitance came: the bottle of thick, bright orange salad dressing, accompanied by plates of plain iceberg lettuce, ready for drenching. Times have certainly changed, but when a local magazine revealed the now defunct restaurant's “secret recipe” it immediately became our family favorite, no white gloves needed. I’m sure you’ll have repeat customers of your own. 1. In a blender or food processor combine all ingredients except oil. Process until mixture is smooth and creamy. 2. With machine running, slowly add vegetable oil. Blend until thick.